Over last three decades, the global energy fuel mix has undergone a major shift with increasing use of natural gas. Natural gas has assumed a sizable position as fuel for industrial, power and transportation requirements. India has also witnessed a rapid rise in usage of natural gas over last half a decade or so. Gepdec is at the forefront of this technology and is among the first players to enter the lucrative city gas distribution business in the country. Because of its chemical bonding property (having only one carbon atom for four hydrogen atoms), natural gas enjoys the lowest carbon to hydrogen ratio, resulting in a clean burn with lower emission than any other fuel. The emission of all polluting gasses as well as particulate matters decreases tremendously by using natural gas. Also compressed natural gas (CNG) is lead and benzene free, making it even more environmentally friendly. Over last three decades, the global energy fuel mix has undergone a major shift with increasing use of natural gas. Natural gas has assumed a sizable position as fuel for industrial, power and transportation requirements. Traditionally, natural gas has been consumed extensively in industrialized world. However, China and India are emerging as major new markets for natural gas. With new gas findings in KG basin, there is a renewed interest in application of natural gas in India. The government of India has accorded high priority on natural gas and has been promoting the use of the same in power, industry as well as transportation. PNGRB (petroleum and natural gas regulatory board) has embarked on an ambitious program of awarding cities for development of natural gas network. In addition to this City Gas Distribution plan, there are major plans afoot to link major consumption centers through cross country pipeline network. 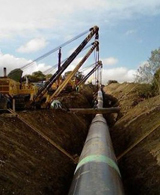 Gepdec has identified gas distribution through pipelines has been identified as a sunrise infrastructure sector. We are amongst the first private sector players to get into this segment and are currently involved in laying gas pipeline for PNG (Pressurized Natural Gas) in western region of the state of UP. Planning, designing, constructing, operating and maintaining a sustainable gas distribution project is a highly complex and challenging job. We are at the forefront of this technology and aim to be one of the topmost gas distributors in the country. However, we are not satisfied with just setting up city gas networks. We intend to move towards both forward integration in gas business by setting up gas based power plants and backward integration by entering into cross country pipeline network.